The slightly unsettling three week break is over and Formula One is set to return to our screens for the Chinese Grand Prix, the third race of the 2013 season. We've seen all sorts in just the two events we've had so far, from relationships crumbling, cars failing, to rookie drivers doing well, and very few penalties given out. Now the action moves on to Shanghai, where there will be more updates on the cars, and the drivers will be keen to get back behind the wheel. All eyes are on Red Bull this weekend, as their drivers get back into action after falling out big time in Sepang. Vettel is unrepentant, and the team orders debate rages as strong as ever. Meanwhile, McLaren are hoping improvements to their car will boost their speed, whilst Force India have their fingers crossed that the pit stop problems don't make a comeback this weekend in China. Support racing for this event includes Porsche Carrera Cup Asia. Rather than keeping our eyes firmly on the skies, this weekend promises to be mostly sunny with the odd cloud or two appearing in the skies. Naturally, there will be some smog and pollution cover, so the sun may struggle to be seen above the circuit, but equally, the forecasts don't mention any rain over the track either. Last year's race in China had just the one DRS zone, and that one continues to be in use this year. Detection comes around the final swirling corner before the exceptionally long back straight. Activation is about a third of the way down that straight, ending in the hairpin. For 2013, a second DRS zone has been added, with a much tighter detection/activation split - the pair coming just before and after the final corner. DRS is then activated for the majority of the home straight. The entire facility is full of symbolism and the layout of the circuit itself is designed in the shape of a Chinese character. The paddock is peaceful and beautiful, mixing the team buildings with trees and water to provide some solitude. 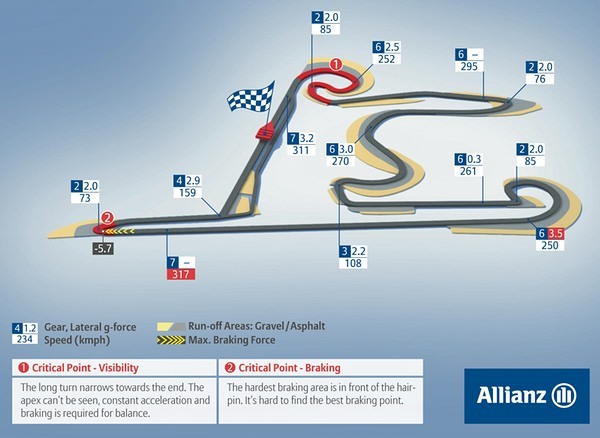 Out on track, there is no peace to be found with a storming 5km lap offering up one of the longest straights on the calendar, and some of the most complex corner layouts you’ll find the cars faced with. The circuit can offer up some interesting overtaking opportunities, particularly with the long straight at the back of the grid. Flat out, in top gear, drivers speed along at well over 300 km/h before braking abruptly for the following hairpin. Managing the difference between roaring along in seventh gear, then dropping down to first can be the key factor in gaining a pole position, or overtaking the man in front during the race. 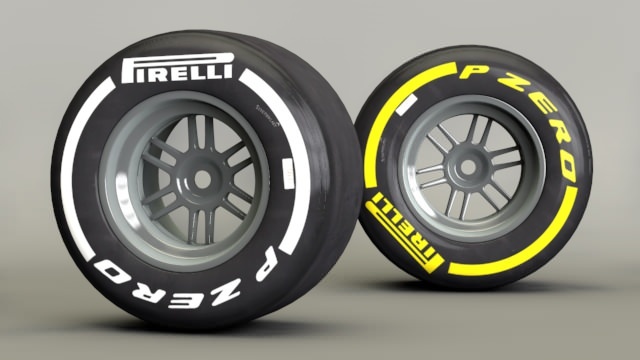 This soft and medium compounds were in action for the Chinese GP last year and Pirelli have decided to stick with the selection, bringing the white and yellow sidewalls to Shanghai. As ever, we've heard a lot of complaints about the tyres being so much softer this year, but Pirelli are confident the drivers will get on top of them soon. Motorsport Director, Paul Hembery, had this to say about the next stop on the calendar. China has often produced some of the best races of the year, where strategy has been at the forefront of the action... Shanghai is less aggressive on the tyres than the last round in Malaysia but we would expect to see the majority of competitors go for three stops although some may try two.